The way social media has ingrained itself into our lives and become nearly indispensable is amazing. These days it’s hard to find someone who is not present on one social channel or the other. Instagram has carved a niche for itself even though Facebook and Twitter grab more headlines. Available on Android and iOS, Instagram lets you share photos and short videos with your followers in a jiffy. Its impressive range of digital filters also lures a majority of users to Instagram. Instagram has more than 200 million active users monthly including some hot-shot celebrities. Even big businesses have jumped into the bandwagon for marketing and brand promotion. While Instagram is efficient by itself, you can use third-party apps to enhance its efficacy even further. 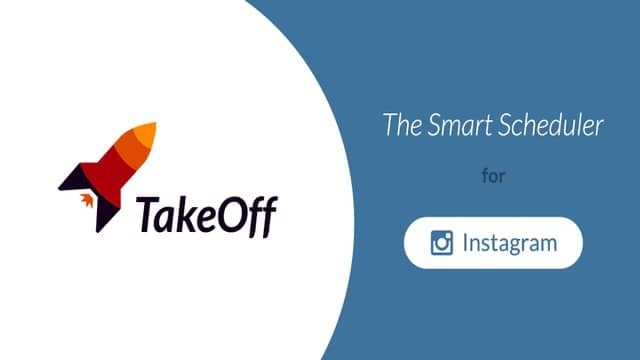 We found TakeOff to be one of the best Instagram scheduler app out there. You may find several apps in both Apple Store and Google Play that can be used with Instagram. However, not all of them can actually enhance your Instagram experience, in reality. 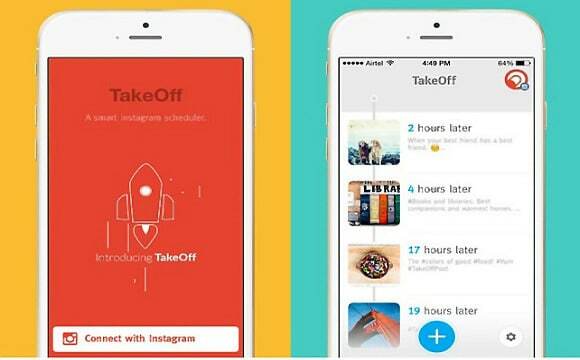 TakeOff is a free app and it lets you share Instagram posts at a defined schedule. It is quite simple and posts your Instagram images and videos at an optimum time to get most exposure. You just need to pick the images you want to be posted and add captions to them. It lets you schedule 10 posts per day through Instagram. User-friendly UI, making things easier for the less tech savvy lot. The app decides the apt time to post images on its own, no manual intervention is required. It is smart enough to suggest the most appropriate hashtags for your images before posting. This ensures those posts get the maximum response from your followers. You need to download the app from Google Play or Apple Store first, based on the platform and device you use. After installation, launch the app and log in using your existing Instagram account. This is a mandatory step as the app itself will not interact with either Facebook or Instagram app on your device. You can use multiple Instagram accounts on the app. After signing in with the account, tap the small cog wheel at bottom right corner of the UI to pick the images that will be posted later by TakeOff. To compose a post, you need to tap the big blue plus button. It is possible to take a photo from the camera roll and you may also snap a picture using the camera app. Thereafter, you need to select the image and crop it if required. Add a caption for your post and select hashtags to go with it. The app also suggests hashtags, in case you’re not sure. After that, you will need to click the green ‘Done’ button at the top right corner and the image is scheduled for posting later. The app’s home screen shows the duration after which the selected images will be posted. You get some amount of control over the images posted by Takeoff. It is possible to delete and edit the selected posts at any time prior to Takeoff’s posting. You may also post an image manually by using the ‘Post’ button, if you wish so. 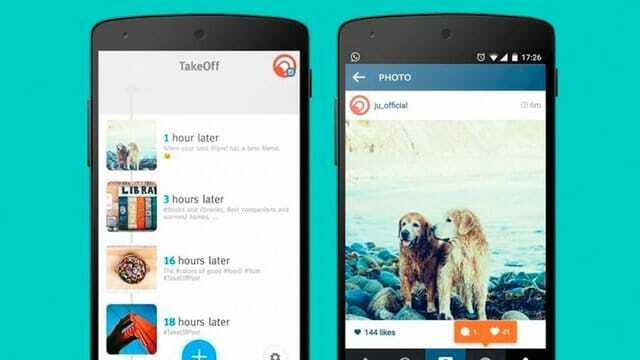 TakeOff can work with various Instagram accounts, as it is. You can add a new account by tapping the existing profile picture in the app UI and then entering credentials of the new account. When you want to schedule a post, choose any of the added accounts. It lacks any filter at all. So, you will have to rely on filters of Instagram for adding effects. It decides the posting time and you cannot set a custom date. Some Android Lollipop users have reported performance issues, though users of older versions say the app works perfectly. The iPhone version also works very smooth. Instagram is a widely used media sharing app loved by Android and iOS users. You may enhance its usability by using an app like TakeOff. A consistent flow of content is a prerequisite for social media success and it does a nice job of auto scheduling Instagram posts to get the optimum mileage for your posts. Go ahead, give this one a spin!